All living things need water. Waterways in the Minnesota River Basin support a diverse array of plants and animals. Healthy water contains a balanced amount of nutrients and normal fluctuation in temperature. It also has plenty of oxygen and little sediment so that underwater living plants and animals can breathe or receive enough sunlight to grow. Monitoring the changes to the waterways in the Minnesota River Basin is important because the data collected can help scientists make determinations about water quality. To determine water quality, scientists measure selected physical, chemical, and biological characteristics. For example, they measure and analyze temperature, dissolved mineral content, and number of bacteria. These characteristics are then compared to numeric standards and guidelines to decide if the water is suitable for a particular use. What is the current water quality in the Minnesota River Basin? The Minnesota River has been cited as one of the most polluted rivers in the state and nation. As the state’s largest tributary of the Mississippi River, the Minnesota River’s volume increases the Mississippi’s flow by 57% and adds disproportionately to its pollutant load. Considerable attention and support have been given to clean up efforts. In recent years, there have been significant improvements in point source pollution control (like industrial and wastewater treatment plant improvements) as well as continued adoption of conservation and best management practices within the Minnesota River Basin. The challenge ahead lies in managing the array of nonpoint-source inputs. With the clean up efforts, comes the expectation that the monitoring data being collected will or can be used not only to identify potential problem areas but also to quantify the impact of these changes on water quality. The collaborative water quality monitoring effort serves as a foundation for gauging progress toward a cleaner Minnesota River. 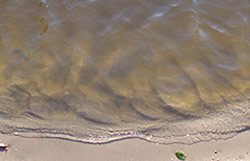 Learn more about Impaired Waters in the Minnesota River Basin. What are the major pollutants of concern in Minnesota River Basin?